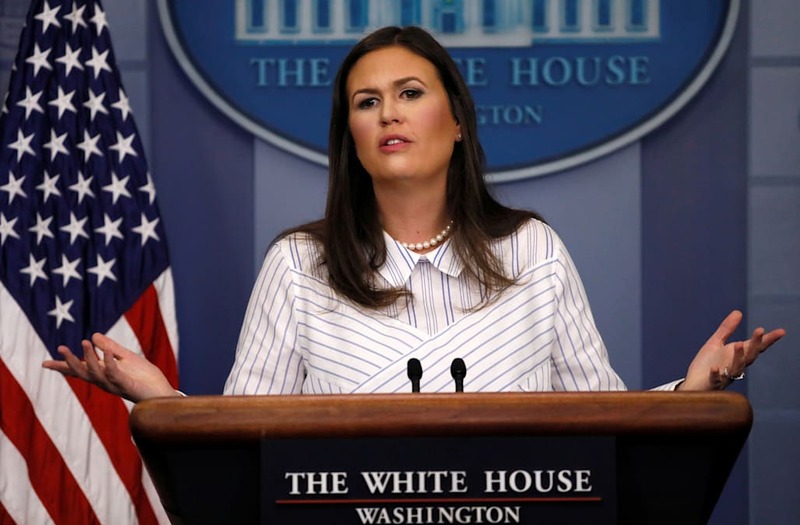 White House press secretary Sarah Huckabee Sanders on Tuesday said the Justice Department "should certainly look at" prosecuting former FBI Director James Comey for leaking "privileged information" and giving "false testimony" to Congress. "His actions were improper and likely could have been illegal," Sanders said when asked whether the president stands by his decision to fire Comey. A reporter then followed up and asked whether the president would "encourage the DOJ to prosecute Comey" over the leaked notes and the "potential false testimony." "That's not the President's role," Sanders replied. "That’s the job of the Department of Justice, and something they should certainly look at." "I think if there's ever a moment where we feel someone has broken the law, particularly if they're the head of the FBI, I think that's something that certainly should be looked at," Sanders added. "[Sarah] wasn't drawing a conclusion," the official said. "She was talking about the president's decision to end Comey's employment with the FBI...the legality is something for others to sort out." The official said that Sanders' references to Comey's "false testimony" had to do with his remarks about Hillary Clinton's emails that he had to correct later. But they demurred when asked whether the White House believes Comey lied about his specific interactions with the president. Sanders' accusations prompted backlash from legal experts and former Justice Department officials who said her remarks amounted to "slander" and represented an "inappropriate" politicization of the DOJ. "What an an absolutely inappropriate thing for her to say. A total politicization of law enforcement by the WH," said former DOJ spokesman Matthew Miller, who served under President Barack Obama. "Comey's memos weren't classified, so no law violated in leaking them," Miller added. "Sanders is suggesting DOJ pursue political retaliation, plain & simple." Ben Wittes, a friend of Comey and the editor-in-chief of Lawfare, a blog dedicated to national security issues, told Business Insider on Tuesday that "Jim Comey would not have mishandled classified information." FBI special counsel Robert Mueller is examining whether Trump obstructed justice in firing Comey, who was leading the probe into the Trump campaign's contacts with Russian officials during the election. Trump's legal team reportedly attacked Comey's credibility in a memo sent to Mueller's team pushing back on the obstruction accusations — attacks that Sanders seems to be carrying over into the White House briefing room. "The fact that [Sanders] keeps misstating the law isn't funny," tweeted former federal prosecutor Renato Mariotti. "It's part of a calculated attack on a man with a career in law enforcement." Comey told the Senate Intelligence Committee that he had been irked by Trump's frequent overtures, ranging from phone calls to dinners to hugs. He told Wittes, who wrote about the encounters earlier this year, that he felt the need to shield the Russia investigation from White House pressure. Trump has denied ever acting inappropriately, leading to suggestions from the White House that Comey lied under oath during his congressional testimony. But Wittes — who emphasized that he was speaking only for himself, and not on Comey's behalf — insisted that "everything Jim told me at the time is consistent with the way he described it subsequently in his testimony." "Being the president of the United States is not a license to slander people," Wittes added. "It is the stuff of banana republics ... beyond that, people in glass houses shouldn't throw stones at brick houses. Trump lies serially. Jim has surely made some mistakes in his life, but he is a thoroughly decent and honorable person." It is not the first time the White House has sought to project a degree of control over the DOJ. Trump has publicly attacked Attorney General Jeff Sessions for recusing himself from the Russia probe, and former White House communications director Anthony Scaramucci suggested to a reporter that he had asked the FBI to investigate his West Wing rivals. Trump's attacks on DOJ officials have extended to Twitter, where he has repeatedly questioned the credibility of Deputy Attorney General Rod Rosenstein, acting FBI Director Andrew McCabe, and Mueller. "President Trump's actions appear aimed at destroying the fundamental independence of the Justice Department," Sally Yates, the former acting Attorney General fired by Trump in January, wrote in The New York Times in July. She added: "All the while, he's ripping the blindfold off Lady Justice and attempting to turn the department into a sword to seek vengeance against his perceived enemies and a shield to protect himself and his allies."